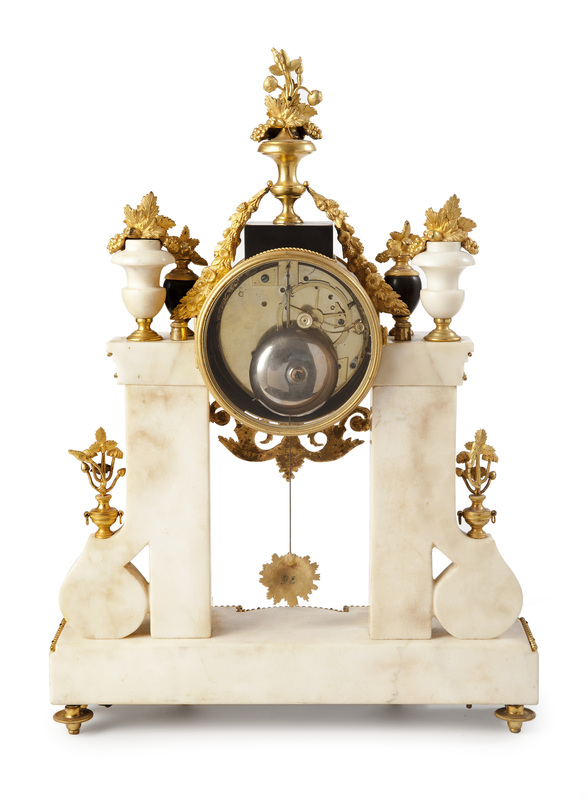 The eight-day spring-driven movement of this portico mantel clock is constructed between circular plates, has anchor escapement and a silk-suspended pendulum with a sunburst bob. 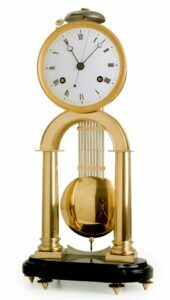 It has a striking train, regulated by an external countwheel, which indicates the hours fully and the half hours with a single stroke on a bell. The convex enamel dial has black Arabic hour numerals with Arabic quarter-hour, five-minute and minute divisions. The clock is signed in blue by the maker below the middle of the dial: Rouvière A Paris. Above the 12 is a regulation arbor which controls the length of the suspension wire of the pendulum. 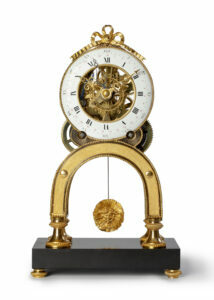 The time is indicated by a fine pair of symmetrically pierced and chased gilt-brass hands. 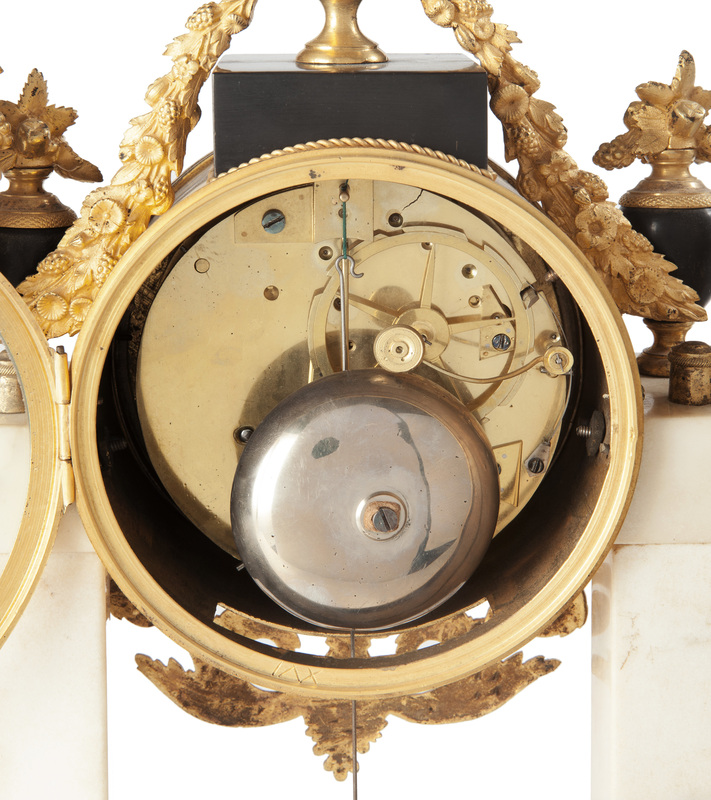 The dial is protected by a convex glass set in a machined gilt-brass bezel with a pearl string. 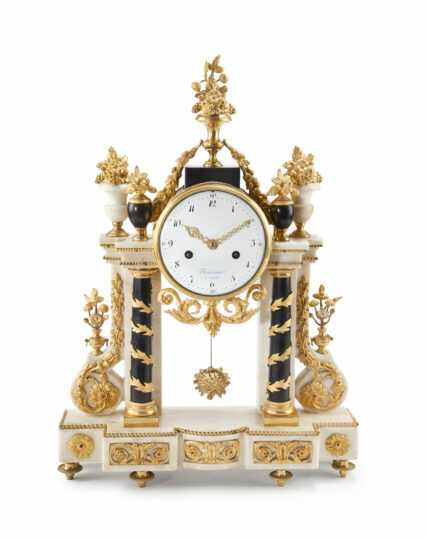 The black and white marble case of this portico mantle clock has a shaped base with recesses on the front, embellished by pierced gilt cast-brass ornaments and a pearl string around the top. There are two gilt-brass capped black-marble pillars, which are embellished by winding gilt-brass vines, supporting a stepped plateau, next to two other, shaped white marble pillars with a rectangular profile. These pillars have scroll-shaped bases on the extremes, surmounted by two gilt cast-brass vases with flowers. There are additional ornaments along these pillars in the shape of flowers and leaf vines with berries. The plateau has gilt-brass pearl strings all around the edges. The movement is situated on this plateau, flanked by two black-marble vases and two white-marble vases with gilt-brass bases and containing gilt-brass flower and berry bouquets. Below the movement is an additional scroll and leaf ornament. 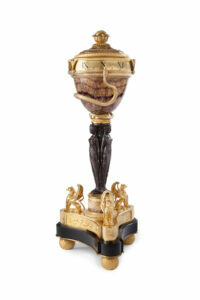 The movement is surmounted by a shaped gilt-brass vase containing a bouquet on a black-marble base adorned by leaf vines to the sides. The whole rests on six gilt-brass toupie feet. Tardy, Dictionnaire des Horlogers Français, Paris, 1971, p. 577. Jean-Louis Rouvière became a master clockmaker in 1781. He had his workshop in the Rue de Rohan in Paris around 1783. From 1789 to 1806 he was established in the Rue de Petit Lion St. Saveur.